Within this section of the website you can learn about some interesting facts and other aspects about Ultraviolet rays that I may not have touched on within other areas of the website. 1. Ultraviolet simply means "beyond light", in this case the visible type that us humans can see. It is also called "black light" due to it being invisible. 2. UV rays can be used to sterilize and disinfect hospital and other medical equipment. This happens when the equipment in question is exposed to artificial light created by UV lamps. The Ultraviolet radiation emitted by the lamps kills any living cells (good or bad) on the equipment. Image 2: Medical Equipment like surgical scissors can be sterilised using UV rays. 3. Bees can actually see Ultraviolet light, as they use it to direct themselves to pollen when the UV radiation is reflected off of flower petals. Without bees pollenating, the whole of the Earth's ecosystem would struggle. 4. In police forensics, Ultraviolet light can be used, in conjunction with special powder, to detect finger and shoe prints that can help solve crimes. 5. The traditional Spanish beach umbrellas found at Beaches along the coasts of southern Spain do not provide sufficient sun protection. A study has revealed a third of UV rays still reach the skin. 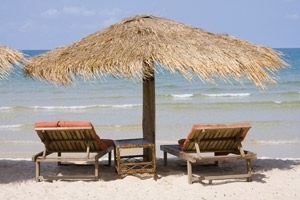 The study found 5% of UV radiation (UV rays) passes through the umbrella with up to 35% reflecting off the sand around the seemingly shaded area and onto the skin. Image 3: Traditional Spanish Beach umbrellas do not provide sufficient sun protection. i) A - Asymmetry. Does one half of the mole look like the other? ii) B - Border Irregularity. Are the edyes smooth and regular or are they crooked? iii) Colour. Is the colour uneven? iiii) Diameter. Is it larger than one cm? If your mole has any of the above irregularities, seek specialist advice from a dermatologist (skin specialist). Do not panic though as your mole may not be cancerous. 7. Be cautious when buying suncream. It has been proven by such organisations as BBC Watchdog (a field of people determined to stop consumers being scammed predominantly in Britain), that suncream manufacturers do lie about the SPF or Protection level of their product so they can make a bigger profit margin. 8. Photo-ageing is a sign of over-exposure to UV rays. When a tan develops (something that is a bad sign), melanin (a pigment produced by the skin to prevent the damage of itself in the sun) is produced. Although people, especially within the Western world, have an obseesion with tans, they do not realise that although they may look good at the time, years into the future their skin will be less attractive, having wrinkled and sagged at a premature age compared to that of the natural process, as a result of sun-bathing. This process is known as Photo-ageing. Image 4: Photo-ageing is a sign over over-exposure to UV rays and it can make the skin look older than it is. 9. More UV radiation is exposed to humans in summer as this is when the sun is longest in the sky for (in terms of time). On a sunny, winter's day though, you can still get sun burned - temperature does not dictate the amount of UV radiation being emitted. 10. Clouds do block some UV radiation from reaching ground-level, but only if the clouds are thick. 11. In nature Elephants are an example of self-aware creatures. They realise that their skin can become sun burned and wisely coat themselves up in a protective layer of mud! 12. UV rays are a form of energy placed on the electromagnetic spectrum, and therefore are a type of wave. They have a short wavelength, and a high yet decreasing frequency. 13. UV rays travel extremely fast. 14. Between 11am and 4pm is when most Ultraviolet radiation is apparant outside during summer months. This does not mean you can not get sun burned at other times! 15. UV rays can penetrate glass to an extent. Standard car windows block - out 97% of UVB rays whilst UVA rays are only blocked - out by 37%. This means you can go on a long car journey and still get sun burned even by sitting in the car! Image 5: A diagram explaining some interesting facts, some of which have been said above. 16. If you have come to read this website as I result of seeing one of my posters up anywhere in your local workplace or school, you may be wondering what the image is of on that poster. It is in fact an image of the skin below the surface, showing the damage to the skin cells thanks to UV rays. Image 6: A poster design I created for my project. The image shown is in fact of the skin below the surface.